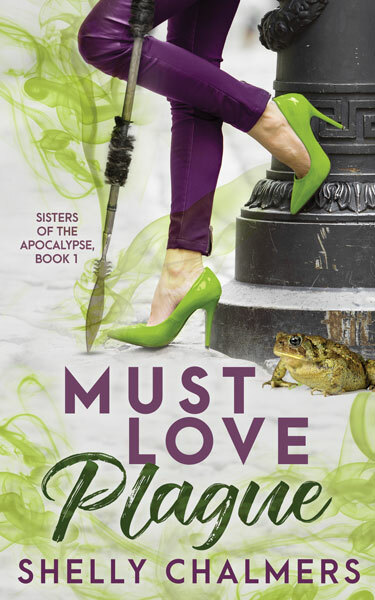 Giveaway: Shelly is giving away two eBook copies of Must Love Plague in the format of preference (eBook or mobi). Shelly: There’s been some fairly big changes since I was last here. I now have two little girls under eight, which is both wonderful and terrifying (especially in some of their similarities to me – I’ll be outmaneuvered by the time they’re twelve.) And the other big change is that as of today, I am officially a published author! Following the many talented authors who have gone before me—and after a year with a lot of frustration and heartache when I realized I wasn’t good at fitting into a box–I decided to take full control of my career and independently publish. The prospect of which leaves me both excited-terrified that my little book is out in the hands of readers, and that my career has entered a new stage. Me: How many books have you written? How long does it typically take you to write a book? What’s the most painful part of the writing process for you? Me: What’s your writer’s mantra? Why does that mantra speak to you? Shelly: I have two connected writing mantras (I did mention I’m not very good at fitting inside a box, right?) 😉 The first is: separate yourself from the road you’re on. The pitfalls are part of the road—not you. I have that one written on a piece of paper I look at from my laptop, and it reminds me that what happens in my career is not always going to be my fault, nor something I can always control, which is hard for a control-freak like me. All I can do is the best that I can, and that has to be enough. The second part of that mantra is: “keep your eyes on your own path.” Or in other words, as Mark Twain said, “comparison is the death of joy.” So maybe my career path isn’t what I imagined, and perhaps not as easy (or difficult) as those of other authors I know. Doesn’t matter. My path is my own, and comparing myself to them—especially if it leads to professional jealousy—doesn’t help anyone. My path is my own, rutted and bumpy as it may be, and my job is to just keep moving forward. Me: What do you collect? Why? What personal meaning does this item have for you? Shelly: I seem to start many of my collections by chance, and I have a few of them. There are my teapots, which I like because of their connection to history…and because they’re pretty. 😉 I have also somehow become the family history keeper, with family photos and mementoes ranging from my great-uncle’s letters written during the second world war, to a pump organ brought from Europe when parts of my family first immigrated to North America. These are important to me as physical reminders of the people who have gone before me, and who I don’t think deserve to be forgotten. It connects me firmly in the network of my family, all those before and all those to come, which is comforting. By retelling and preserving their stories and physical reminders of their existence, we honor their memory, and at least their memory can live forever. Me: What genre(s) do you write? Why do those particular kind of books call you to write them? Shelly: I write paranormal romance that runs the gamut from paranormal Regency to contemporary paranormal to space opera. Paranormal appeals to me because I don’t think there’s enough magic in the world, and frankly, I want to live in a world that isn’t all heart-breaking headlines, and black and white facts. I want to believe there’s more. I also add a lot of humor to my writing since those are the kinds of books I love reading too, because they can make me smile even when I’m feeling lousy. If I can make someone smile with one of my books, then I think I’m doing okay. Me: Tell me about your debut paranormal romance novel Must Love Plague. Spreading disease isn’t all it’s cracked up to be. Piper Bane wants nothing to do with her pesky Pestilence bloodline and would give anything to be a Normal. In fact, she put Beckwell–land of the paranormal and home of the weird–in her rear-view ten years ago, and hasn’t been back since. Until an invitation to her best friend’s wedding coaxes her back home and reminds her what it means to continue the legacy of the four horsemen of the apocalypse. She receives a typical Beckwell welcome the second she reaches the city limits where she’s stalked by a toad and wraps her car around a tree. And is rescued by the one person she most wants to avoid: Daniel Quilan. Town doctor, genuine nice guy, and her ex-fiancé. Ten years hasn’t been long enough for Daniel Quilan to forget the only woman he’s ever loved. His responsibilities as Beckwell’s only doctor keeps his mind off the hole Piper Bane left in his chest when she broke his heart and skipped town all those years ago. His not-so-ordinary patients and his trouble-making twin brother keep Daniel occupied twenty-four-seven, not to mention magic going haywire throughout town. But his plan to stay busy as the town’s golden boy is shattered when his latest patient turns out to be Piper. How good she looks isn’t his concern. How she still makes fire shoot through his veins isn’t his focus. But the fact that someone wants to end the world and will use Piper to do so……that makes her impossible to ignore. Me: Share with us a favorite excerpt. This section for me typifies Daniel’s sweetness and enduring hope even after Piper broke his heart ten years ago, and no matter how much he tries to deny it. When he gets a chance to protect Piper and invites her back home, she’s caught off guard by the house he’s living in. Not his family home, but the house that had been their secret place, the first place they made love. The porch squeaked as she stepped onto it, and she trailed her fingertips lightly over the peeling paint on the handrail, the other collapsed and tangled in weeds. Back then, they’d still believed they could make a normal live for themselves. That they could be happy. That just maybe they weren’t defined and trapped by their ancestors and the latent magic that lurked in their blood. Light blossomed inside and Daniel turned, an imposingly large silhouette within the doorway. This wasn’t the boy on the cusp of manhood she’d left behind. This was a darkly compelling man with secrets of his own. And whatever she’d said about them being adults and friends, as she stepped through the doorway, her fingers and toes tingling, it sure the heck didn’t feel as if she was just crashing with an old friend. Her breath caught. Ten years ago. Before he’d proposed. It would have been theirs. 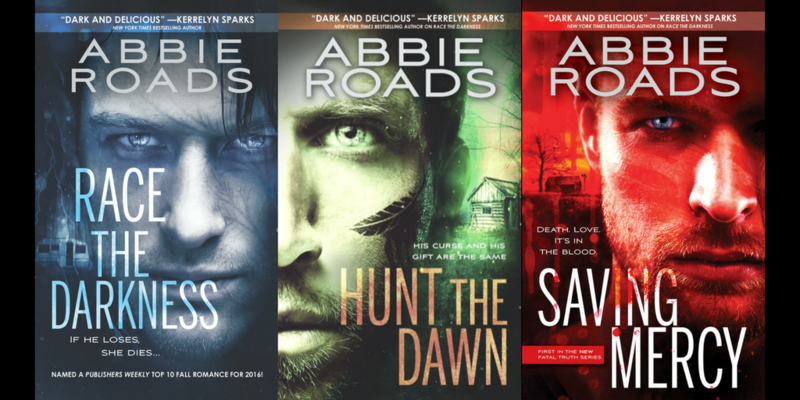 Abbie Roads writes dark emotional novels featuring damaged characters, but always gives her hero and heroine a happy ending… after torturing them for three hundred pages. Purple and lime green? Why the heck not?! Love the cover. Great interview! This is going on my TBR. Thanks for coming and sharing your work with us. Thanks for the chance to win. Hi Linda! Thanks for stopping by. 🙂 Best of luck to you in the draw. Thank you, McCall! I’m terrible with titles, so when I finally came up with these ones, I wasn’t sure they’d work – but seem to be getting the response I’d hoped for. Thanks for stopping by! Looks like an awesome read. Cindy O – LOL! Twisted minds and a taste for the unusual are some of my favorite kinds of people – although I may be a bit biased (I’m one of them). 😉 I’m glad it sounds like fun, and thanks so much for stopping by! Fantastic post (and the earlier interview too was fabulous – yes, I went back and checked it out!). This sounds like a great read Shelly, and I agree the world needs more magic, and we all need more laughter. Congrats on your book release and best wishes on this next step in your writing journey! I love reading paranormal! This sounds so good!! Hi Katrina, thank you for coming by. 🙂 Yay! 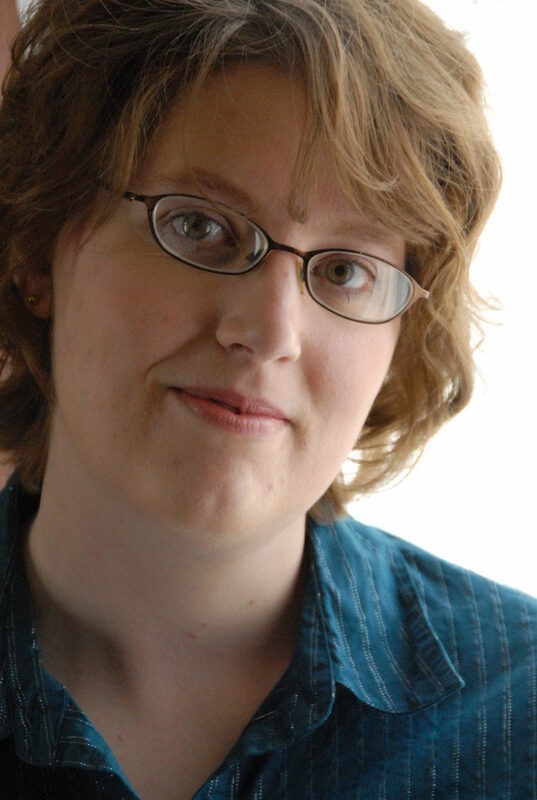 Another paranormal reader (yes, I’m totally biased, but I love paranormal readers best…and I am one too.) Thanks for your kind words! Happy to meet a new author! I love PNR & your book sounds wonderful! Hi Beverly! Nice to meet you, too. 🙂 Thanks for stopping by and for your kind words! Paranormal is my favorite genre too – I love all the flavours it can encompass. I am SO freaking thrilled for you today, Shelly! You deserve bestseller sales for all you’ve done for writers and readers through these years I’ve known you. And such a DARLING cover- I can hardly wait for my 7a flight tomorrow to crack into it!! Best of luck! Aww, thank you, Sarah! I absolutely adore this cover myself – by Christa Holland with Paper & Sage, and can hardly wait to work on the next ones! And hope you enjoy, and that flight is a good one. Safe travels, and thanks for stopping by! Oooh I REALLY love that excerpt. You are on your way, Shelly, and I can’t wait to watch your career grow with this brilliant series! Also… I’m so glad to finally know who coined “comparison is the death of joy.” I love that quote, and didn’t know who originally said it! Happy book birthday to you!! Great interview! I’d say you’re in control and zipping down your path right now, Shelly. Congratulations! Happy you’re experiencing that debut novel joy. I love what you said about making a reader smile. What a privilege that we get to do that, huh? Sheri, thanks for coming by and for the congrats. I am experiencing that joy – silly grin on my face right now. 😉 And yes, it sure is a privilege getting to make a reader smile, isn’t it? Definitely what I aim for, especially when some days we know it isn’t easy. I am thrilled you’ve published this book, Shelly! Congratulations!! And I love your mantras–I hadn’t heard that first one before, and it took me by surprise. I hope you have a fantastic book birthday–and many more to come!